Graphus was awarded a U.S. patent for automatically detecting and and handling targeted email attacks commonly referred to as spear phishing and social engineering. Graphus is known for using artificial intelligence and graph theory to establish company-specific Trust Graph™ that differentiates between trusted and untrusted communications. Graphus protects organizations from the most common types of cybersecurity attacks today. We are pleased that this patent award confirms Graphus’ approach to identifying social engineering and spear phishing emails is unique. Graphus, the leader in automated social engineering and spear phishing email detection, today announced it has been awarded a patent by the U.S. Patent and Trademark Office (USPTO) for detecting and handling targeted email attacks. Graphus is known for its unique approach using artificial intelligence algorithms and graph theory to establish a Trust Graph™ between business email recipients and the people and networks they interact with. The patent also includes determination of a “trust rating” for incoming email based on a number of factors. “Ninety-one percent of successful cyber attacks now begin with emails targeting specific employees. Cyber criminals use targeting along with social engineering and spear phishing techniques because it is a proven formula. These are attacks on people that then unwittingly aid cyber criminals in their efforts. About six out of ten companies will be victims of successful email-based social engineering attacks this year alone. Graphus’ development of Trust Graph™ technology tackles this problem directly. We are pleased that this patent award confirms Graphus’ approach to identifying social engineering and spear phishing emails is unique,” said Manoj Srivastava, CEO and co-founder of Graphus. 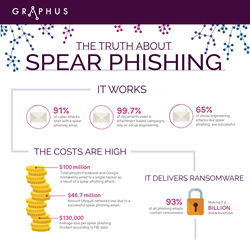 Graphus provides immediate protection and peace of mind by automatically identifying 99% of social engineering, spear phishing, and malware attacks. Graphus employs patented AI technology to establish a Trust Graph™ between people, devices, and networks to reveal untrusted communication and detect threats. Companies can activate Graphus in less than a minute. Graphus was founded in 2015 and is headquartered in Reston, Virginia.